The Progressive® Insurance Miami International Boat Show, presented by West Marine, returns to the iconic Miami Marine Stadium Park and Basin February 14-18, where an estimated 100,000 attendees from around the globe will gather to enjoy the five biggest days in boating. 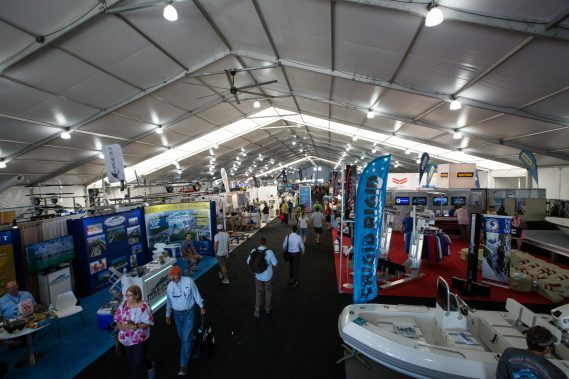 Recognized as one of the world’s largest and greatest boat shows, the Miami Boat Show is the ultimate destination for boaters and dreamers alike, showcasing thousands of the newest boats, marine technologies, and boating accessories from leading manufacturers. 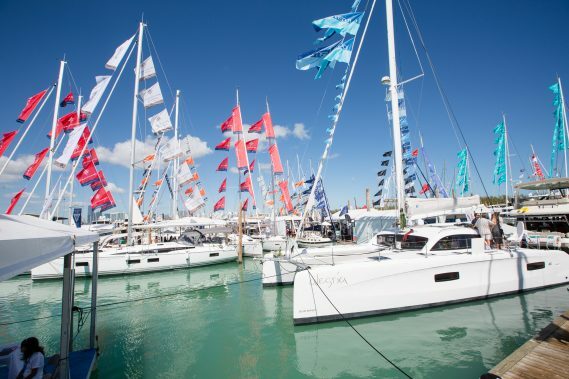 What’s more, the 2019 Progressive Insurance Miami International Boat Show has a variety of opportunities to experience the joys of the boating lifestyle firsthand – from test drives and boating lessons, to a first-class VIP experience and sailing seminars. New for 2019, show goers have the opportunity to learn more about going green on the water at the new Conservation Village, and the new BoatU.S. On-Water Training gives attendees the chance to sharpen their boat handling skills with a variety of daily courses. With more than 1,400 new boats on display on land and in-water – many making their debut at the Miami Boat Show – there is a deal to shop for every boater. From motor yachts and catamarans, to offshore fishing boats, family cruisers, and sailboats, this is THE destination to discover what’s new in boating and take advantage of specials on the newest makes and models. Not in the market for a boat? Stock up on anything needed for a day of fun on the water, with thousands of exhibitors offering the latest in new marine technologies, gear, accessories and apparel. New for 2019! Curious about boating and want to gain more confidence on the water? Learn a variety of boat handling skills with the Miami Boat Show’s new Boat U.S. On-Water Training Program. Experience daily power boating and sailing courses on the water, taught by U.S. Coast Guard-certified captain captains. Space is limited; advance registration is recommended. Sea Trials are unique to the Miami Boat Show and provide an opportunity for serious boat buyers to take their dreamboat for a spin on Miami’s open waters prior to purchase, with an opportunity to test drive more than 200 boats from leading manufacturers. Learn about the importance of marine conservation and ways to help protect ocean and marine environments. Presented by Costa del Mar, experts in the Conservation Village will be on hand to educate and inform attendees about critical environmental issues, from efforts to restore and protect marine ecosystems to game fish conservation. Reusable water containers are also for sale at the show, and unfiltered water stations have been added to the show site. Sailor’s Cove – formerly Strictly Sail Miami – features the world’s leading sailing exhibitors, gear and accessories, plus the chance for novice sailors and seasoned skippers to hone their skills during daily seminars in the Cove’s pavilion or on the water with daily sailing lessons. Sailor’s Cove also showcases dozens of new sailboats, catamarans and mono-hulls in-water. The 2019 show features a variety of dining options from premiere event caterer Great Performances. Partnering with with many well-known Miami area restaurants and food trucks, the boat show will bring a variety of delicious offerings to show attendees, both waterside and upland. Food and beverage highlights for 2019 include: three sit down, full-service restaurants: the Latin Cafe´, Knife Steakhouse, and SuViche. Additional fun fare from Sushi Maki, Killer Melts, Moty’s, King of Racks BBQ, B.C. Tacos, Ocean Breeze, HipPops and Ministry of Kaapi will also be on the menu. New for 2019! Arriving from wine country, the Meiomi Home is docking at the Miami Boat Show. Designed to resemble a Coastal California Bungalow, it is complete with a kitchen/wine tasting room. Meiomi will educate and provide samples to attendees on Chardonnay, Pinot Noir, Rose and a sparkling wine. The all-inclusive VIP Experience, presented by Porsche, at the Miami Boat Show grants one-day entry to the show with an array of exclusive amenities. In addition to complimentary food, drink and entertainment, guests can enjoy an indoor, luxury lounge featuring air-conditioning and complimentary wi-fi. Adjacent to the lounge is the VIP deck offering unparalleled views of the Miami skyline and the show’s impressive footprint. Learn more about the Miami Boat Show’s VIP Program here. Come visit the Progressive Boat Club! Progressive provides education and inspiration in partnership with the Annapolis School of Seamanship to help attendees get the most of their boating experience. Master docking techniques at Progressive’s docking pool, or take a spin at a Virtual Reality boating experience. Attendees can also chat with a Progressive Insurance expert to ask any questions about boating coverages or get a free quote. Children younger than age 13 can participate in the virtual reality activation with parent’s onsite permission. Borrow a Lifejacket for the Day at the Boat Show, Free of Charge! To help promote proper life jacket use, the Miami Boat Show is working with the Sea Tow Foundation to provide life jackets for attendees, at no cost! Life jacket loaner stations will be stationed in front of the docks at this year’s show for attendees of all ages to use before walking the docks and boarding the hundreds of boats on display in the water. Life jackets can be returned to the loaner stations or at designated boxes around the show. To help show goers get to and from the Miami Boat Show easily, transportation options for 2019 include free water taxi and shuttle bus services from several park and ride locations, including the Brightline garage for those taking the new train into Miami for the show. For a complete list of Miami Boat Show transportation options, visit http://www.miamiboatshow.com/getting-to-the-show. Download the Miami Connections App, powered by RaftUp, to track water taxis arrivals and departures in real time and enjoy other show enhancements. Available to download on iOSand Android. Accommodations: Visit www.MiamiBoatShow.com/accomodations to book rooms at the best rates through the boat show’s official housing partner, Connections Housing.